Previous postHair Cloning 2018 | How Does It Work And When Will Be Avaliable? The main signs of balding in a man, and in certain cases women, is the loss natural color of the hair, full hand of hair after shampoo, scarring, skin lesions and the growth of dandruff. As for people suffering from autoimmune disorders like alopecia areata, the first symptoms will be the loss of hair in unusual areas like above the ears, on their eyebrows, or at the backside of their head – places that male pattern baldness never affects. As for male pattern loss, the loss and thinning of hair starts at the temple and crown before completely thinning out or falling out. Balding, also known as alopecia, is where one starts losing hair from the body and often on the head. This form of hair loss is often experienced by men and is commonly referred to as male pattern hair loss. The causes of this hair loss are attributed to many factors. However, as we have mentioned above, there are forms of balding that are associated with autoimmune disorders like alopecia areata and alopecia totalis, which is the most extreme with the victim losing all hair on their head and body. As mentioned above, hair loss can be brought about by many different factors. These include fungal infections, aging, traumatic damage (where a person compulsively pulls their hair off), nutritional deficiencies, and/or chemotherapy or radiotherapy. Generally, it will take about 15 to 25 years before a person suffering from male pattern hair loss to go bald. However, there are men who go bald in less than five years. Male pattern baldness is a very common hair loss condition that unfortunately afflicts over 2/3 of men throughout their lifetime. Believe it or not, but this type of baldness can strike at a very young age. Sometimes people might begin to see signs of it as early as 18 years of age. Because it is a genetic condition, it is much more likely that you will suffer from it if you have members of your family that have the same condition. However, it is not true that it is only passed down from your mother’s side of the family. Thus, if anyone in your family suffers from it on either side, you are at a much greater risk of getting it as well. This type of baldness does not occur overnight. It is actually a process that typically happens throughout a long stretch of time where your hair follicles essentially stop regrowing hair. you will want to visit a medical professional in order to discuss potential causes for it. Typically, the pattern in which you lose your hair is indicative of the condition that you suffer from (if any). There are a lot of different causes that could cause sudden and increased hair loss. Therefore, just because you find hair on your pillow or you see hair coming out doesn’t necessarily mean you are suffering from baldness. There are definitely other considerations that could come into play. You should head to a medical professional to figure out what is going on. However, there are clear warning signs that you might be suffering from the early stages of male pattern baldness. Below, we will be going over some of them. The problem with men suffering from male pattern baldness is that their hair eventually stops growing back. It’s not about losing the hair, but about the hair follicles shrinking. After some time, the hair that grows out from the shrinking follicles becomes thin before disappearing altogether. If you’re losing large chunks of your hair it isn’t a sign of Androgenic Alopecia, but it could be a sign of other types of alopecia. Men that do in fact suffer from this type of baldness start to lose their hair in a pattern. The first signs will generally include a noticeable receding hairline, which is gradual, but nonetheless will become obvious with time. Male pattern hair loss does have a variety of other symptoms that may not exactly be textbook, but can be easy to recognize. Apart from a receding hairline, thinning or receding hair from the top of the scalp can also be an indicator of permanent hair loss. The way to know for sure if you’re suffering from male pattern hair loss is to take a look at your scalp. This type of hair loss will not affect the sides or the back of your scalp. It is almost certain that you do suffer from male pattern hair loss if the only place you notice hair loss is near or on the top of your head. Hair follicles, which are tiny pouches under the skin, are responsible for creating hair. Each follicle grows a hair for about 3 years. When the 3 years are over, the hair is shed and a new one is grown. In the case of male pattern hair loss, the affected scalp follicles gradually grow smaller. As they shrink, the new hair that grows from the follicle is thinner than the last one. 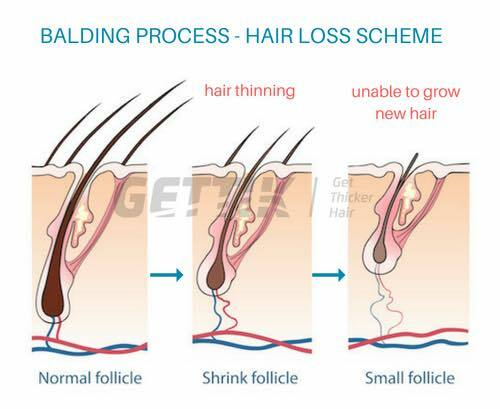 At the same time, the follicle’s hair growth cycle grows shorter and hairs are grown and shed in a lesser time frame than the previous ones. With time, all that is left is a very small follicle and only a thin hair stump that doesn’t even make it out to the surface. Male pattern baldness typically begins at the hairline. During the initial phase, your hair will begin to thin at the temples and the front of your hairline. As time goes on, your hairline will continue to shrink and shrink until you are left with somewhat of a horseshoe shape on your forehead. Another common sign that you are suffering from this type of baldness is if you have a lot of thining in the crown area of your head. For a lot of people, this is actually the first place they notice that they are suffering from this condition. Balding typically affects your head in a specific zone. Therefore, you are likely going to be able to notice this type of thinning much easier. While this is not necessarily going to occur to every single man that suffers from male pattern baldness, it is a common effect that male pattern baldness is affecting you. This is when curly hair begins to show near the hairline on the neck and right over the ears. This usually occurs when the crown begins to thin out and recess. Another sign that you are suffering from male pattern baldness can be seen when you are beginning to lose the hair on the top of your head. A lot of men that suffer from this type of baldness end up suffering from significant hair loss on the top portion of their heads which leads only the sides and the back with hair. If you notice that you are losing hair in specific patches and not just on the top portion of your head, you might be experiencing another type of problem that could be causing your hair to fall out. Male pattern baldness typically affects the center and top portion of one’s head. When we age, our hair gets much thinner naturally. The numbers dictate that around half of men over the age of 50 will have experienced around 50% hair loss. Therefore, preventative measures must be taken in order to prevent this much hair loss if you feel as though you are headed down the same path. While age is a very key factor to know and understand, if your hair is thinning out at a feverish pace, you might be dealing with balding. One of the main things that you should be looking out for is your partings. While some might not be able to notice if their hair is thinning out until it’s too late, a lot of people are going to be familiar with the way they part their hair. Thus, if your hair is thinning out where you part it, you are going to be much more likely to notice it. As a result, if your hair is parting wider or you notice major structural changes in the way your hair parts, you know that you are dealing with balding. While getting dandruff suddenly doesn’t mean you are necessarily dealing with balding itself, it does mean that there is something going on with your scalp and hair. Dandruff is a common sign that you are dealing with balding because it typically causes your scalp to go through serious changes which can alter the hydration and the production of oil in your scalp. Thus, if you notice that you are beginning to suffer from dandruff all of the sudden, you might want to consider getting checked out by a professional that might be able to get to the root of what is happening to your hair. Another common sign that you are balding is if you notice any significant changes to the sensitivity that you might have to specific elements. If you step out in either hot or cold weather, you should pay close attention to how your head feels. If your head used to get extremely hot in the summer and it doesn’t feel as hot anymore, you might be dealing with hair thinning. Likewise, if you notice that you are dealing with much more sunburn when you go out into the sun, you are likely losing a significant amount of hair that used to protect your scalp. You will be able to identify if your scalp is being overly exposed to the sun if you did this. 9. Stop Self Inflicted Hair Loss. When it comes to losing hair, you want to be sure that you are not causing it directly. There are actually a lot of different things that you could be doing in order to cause your hair to fall out and for you to lose hair in general. To put it simply, you will not want to abuse your hair in any way possible. A lot of people abuse their hair every single day by using extremely hot blow dryers or even hair straighteners. These tools can really cause significant damage to your hair follicles because your hair is not meant to be put through that type of physical stress. Also, hair that is put up too tightly can actually slowly get pulled from their roots. Another major thing that you are going to want to keep an eye out for is other major conditions that could directly relate to problems with balding. For instance, if you notice that you are quickly gaining weight, you could be dealing with a thyroid problem that could end up causing hair loss in individuals. Also, you might be dealing with an autoimmune system disorder where your body is targeting your own hair follicles. Another problem that could be causing your hair loss is malnutrition. Lastly, you want to be sure that you are not suffering from ringworm which can cause your hair to fall out. As you can see, there are plenty of different ways to tell if you are suffering from any type of baldness condition. By looking and being proactive about it, you should be able to slow down the process significantly to the point where you are going to be able to minimize the negative effects of balding. You want to be sure to look at all of the key signs that you are balding to ensure that none of them are affecting you and if they are, you will want to be sure to figure out whether or not it is because you are going through a balding process. By visiting a registered health care professional, you should be able to tell whether or not any specific problem is associated with balding or if you are simply going through another health condition that is causing you to lose hair as a side effect or side problem associated with it. There are plenty of reasons you can lose hair at a significant rate. Therefore, you want to be sure that you are dealing with male pattern baldness if you are losing a significant number of hair in a short period of time. That way, you can figure out what to do about it. Who Experiences Male Pattern Hair Loss? Almost all men experience some form of hair loss by their 60’s. However, the time or age at which hair loss starts is not constant. Research shows that out of every ten men, about three will start experiencing hair loss by the time they are 30 years. Interestingly, about half of all the men in their 50’s exhibit some significant balding. Male pattern hair loss is treatable. There are medications that will help balance out the hormones that affect hair growth. By using such medication (Propecia), the patient’s follicles are given a new lease of life and can easily grow back to their normal size; allowing for the normal growth of hair. Nonetheless, most of these medications will take some time before the results desired can be achieved. If you are experiencing any form of hair loss, it is important that you visit your doctor or dermatologist for tests and for more advice on how to handle or work with the condition. Hair loss in men that is the result of an underlying cause of hair follicle vulnerability is called male pattern baldness and is also known as Androgenic alopecia. This is usually the most common type of loss of hair, and it will affect nearly 70% if men at some time during their life.Commonly, men will have the recession of hair at their temples and with vertex balding, or baldness that occurs at the crown of the head Is caused by the DHT hormone increasing, but it has been established that baldness can in fact be genetic. Most commonly, male pattern baldness affects men between the age ranges of 25 to 35, but in some extreme cases, it can start as early as the age of 20. There are certain misconceptions regarding people’s beliefs about Androgenic Alopecia. Most men believe that finding stray hairs on their pillow or losing large chunks of hair is a sign of impending doom, but that couldn’t be further from the truth. A classic case of male pattern baldness usually begins above the temple area and the top of the head, or vertex. It will then progress until a band of hair is left at the sides of the head and in the back. This is commonly called the “Hippocratic Wreath” and does not usually progress to complete baldness. There are several factors that seem to be the culprits in male pattern baldness, and the genetic factor may play an important role. If there was any baldness on your mother’s side of the family, you are more likely to suffer from male pattern baldness. This is not always the case, as you will also see the males in a family suffer from this down through the males on one side of the family. There are other studies that correlate insulin resistance as a cause, and there is a relationship also with men that have pattern baldness also are vulnerable to cardio-vascular problems. The good news with both of these suppositions is that once a pattern balding issue begins to appear, the individual can take steps to guard against both the insulin and the cardio issues. The incidence of androgenic alopecia is linked very closely with age, according to the American Academy of Dermatology, where about half of men will experience hair loss by the time that they reach age 50. Almost all men will have some hair loss by the time they reach their 60’s. However, the age at which hair loss starts varies. Around 30% of men aged 30 and 50% of men aged 50 have significant balding. The common cause for the condition is heredity and it is usually harmless. However, it can also be brought about by some more serious causes such as certain medications, anabolic steroids, thyroid conditions, or certain cancers. If you develop some hair loss soon after taking new medication or after any other health concerns then consult a doctor. Even though normally harmless, the condition can occasionally be linked to metabolic syndrome. This is a combination of diabetes, obesity, high levels of cholesterol, and raised blood pressure. People with this syndrome have an increased risk of heart disease. This link is most commonly visible in those men that develop baldness at a relatively young age. Certified Trichologist IAT and Natural Hair Specialist. Coming from a science and education background, she aims to educate the masses on common hair issues and promote healthy hair care. "As a Certified Trichologist, most of my day is spent consulting with clients who are experiencing some form of hair loss. For many people, this is a major cause of embarrassment and shame, so instead of seeking immediate help, they suffer in silence or are duped into spending a lot of money on fake solutions that can often make the problem worse."